The “tart” here is the same as in “一塌糊涂 Yat Tart Woo Tou” which means “in a complete mess”, “In utter disorder”. So how come this tofu is given this name? It doesn’t look messed up, does it? Actually, the tofu is slightly messed up. One day you decided to take a stroll, and walked out of the house with perfectly coifed hair and a crisply ironed shirt. Then came the rain, caught you without warning and drenched you from top to toe. Oh no! You’ll be in such a mess. Totally "Drop Soup Chicken 落汤鸡"
That’s what happened to this tofu. Firstly it was fried, given a crispy firm crust. Then it was doused with stock to cook…. What happened to the crust? What say you then? Is the tofu messed up? LOL. 1. 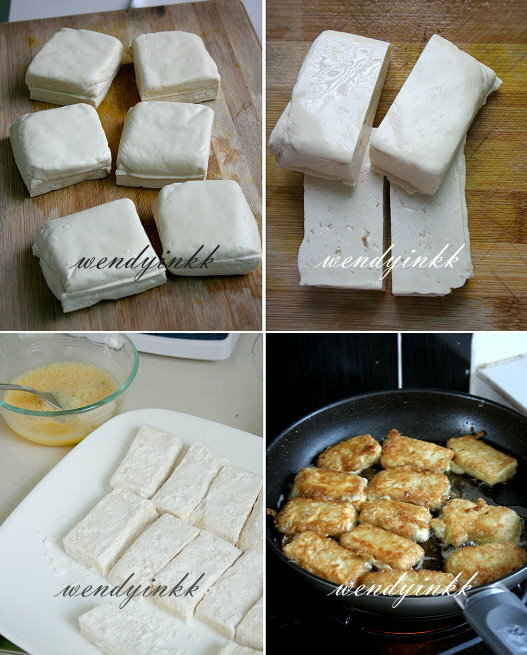 Slice each tofu into 4 pcs (2X1X ½ inches). 2. Coat each piece with flour. Whisk the eggs. 3. Combine water with chicken stock powder, salt and sesame oil. Taste it, it should be oversalted but not toooooo salty. 5. 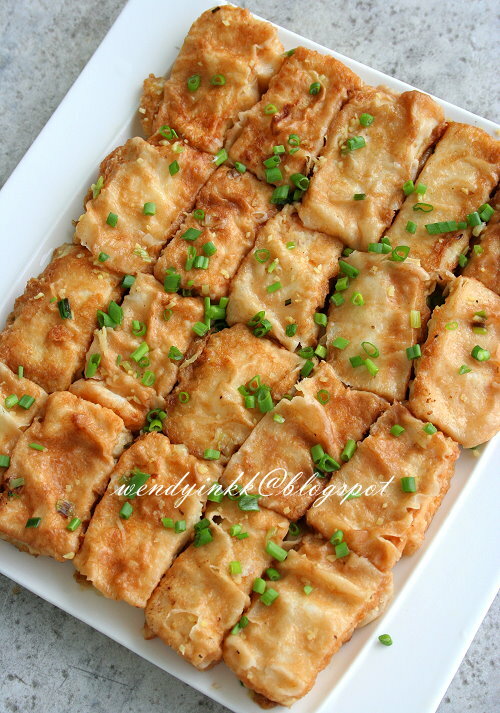 Dip flour coated tofu pieces in egg, one by one and pan fry until golden on both sides. (I fried them in 2 batches, so I floured the 2nd batch after I did the first batch). 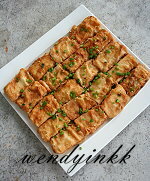 Poke the fried tofu with a fork (lengthwise). 7. Use high heat. Put in chopped ginger and cook until fragrant. 8. Put in white part of spring onions and sauté until fragrant. 9. Return the fried tofu to wok. Gently toss the tofu around for a while. 10. Put in shaoxing wine, and it will sizzle greatly. And you can smell the wine. 11. Then pour in the stock and let it come back to a boil. 12. Continue to cook on low heat(flipping once halway) until all the stock is absorbed. 13. Dish up, and sprinkle with green spring oinions. Take note that this recipe makes quite a big plate of tofu. You can count the pieces and plan for yourself how much can your family consume and then proceed to cook. Simple looking but bursting with flavour. It could catch your guests with surprise to see how a bland looking dish could be flavourful. This dish can be prepared in advance and reheated in the microwave or by steaming, if you’re expecting guests. Shown 20/24pcs that I had because the plate can't fit all 24. MMmmmmm, this looks great. I would like to try it out . 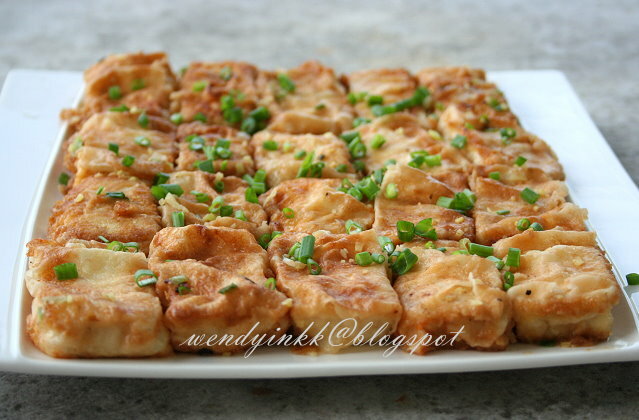 Love tofu prepared in any style :) Thanks for sharing. Interesting dish. So if I add some fiery hot bean paste during round 2 cooking, I will have fiery hot messed up tofu! I love tofu. Thanks for this recipe. Tofu.....is my "Zi Ngoi". It must be yummy and delicious! I still remember I made your "Crispy Mashed Tofu" absolutely delicious. Ur special tofu dish coming up wednesday! While I am still knocking my head thinking of what to cook for tonight dinner.. Your recipe of this just came out in time! What a great recipe! The best part is I have all the ingredients available in my fridge now! Thanks to you for sharing to all of us...Cheers! 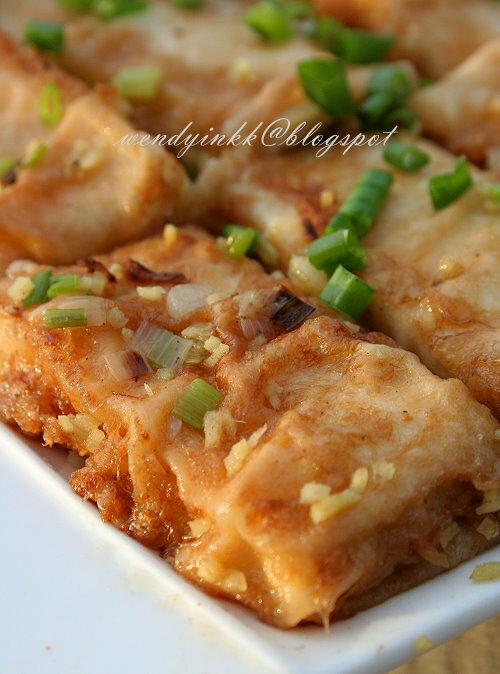 Is pressed taufu "tau kua" ? Many thanks for the recipe. Can't wait to try it. Thanks to sek gou for the calcium, hehehhe. I have heard the term tau kua many times, but I have no idea what is that. Pressed tofu is a firm tofu. hey... I made the same recipe from the same cookbook before too! my family love it too cos they said its really full of flavors! Indeed a very large plate of tofu but it's ok, I can eat it without rice:) Looks so delicious! never mind whether messed up or not. it looks delicious!! Yeah! My coming weekend menu!